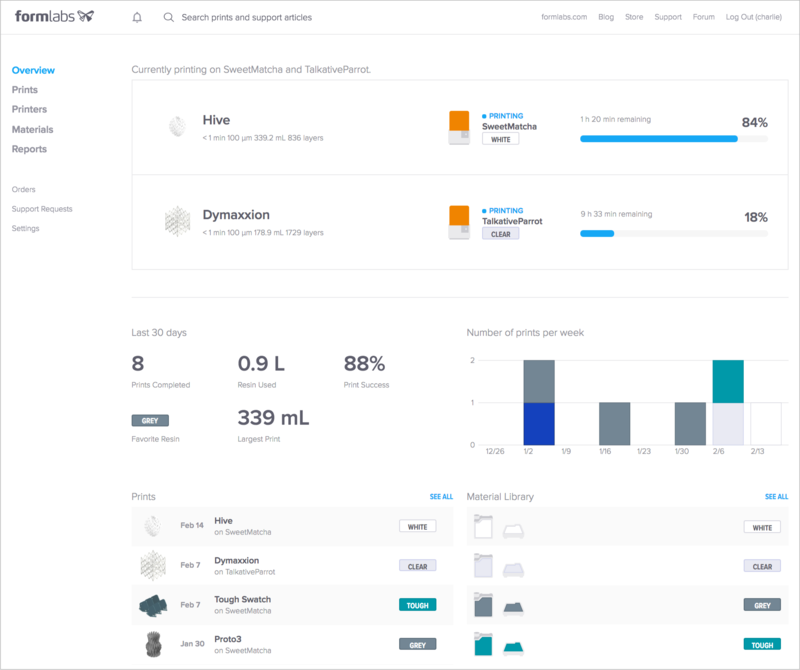 With Formlabs’ Dashboard, you can effortlessly monitor your Formlabs 3D printers, material library, and print jobs from your browser, across devices. Today, we’re updating Dashboard to allow for easier monitoring, analysis, and collaboration across printers. 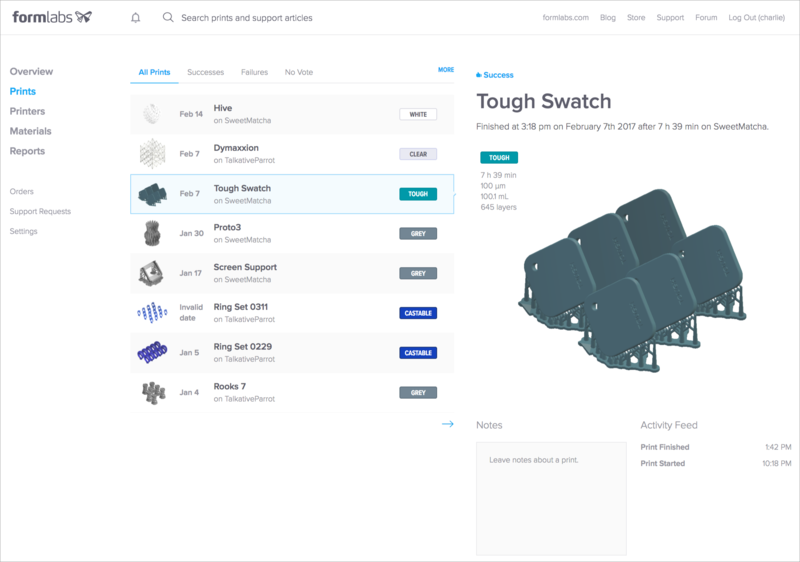 The newly expanded Dashboard includes dedicated pages for your prints, printers, and materials, with more powerful filtering and additional data to help you get the most out of your Formlabs printers. 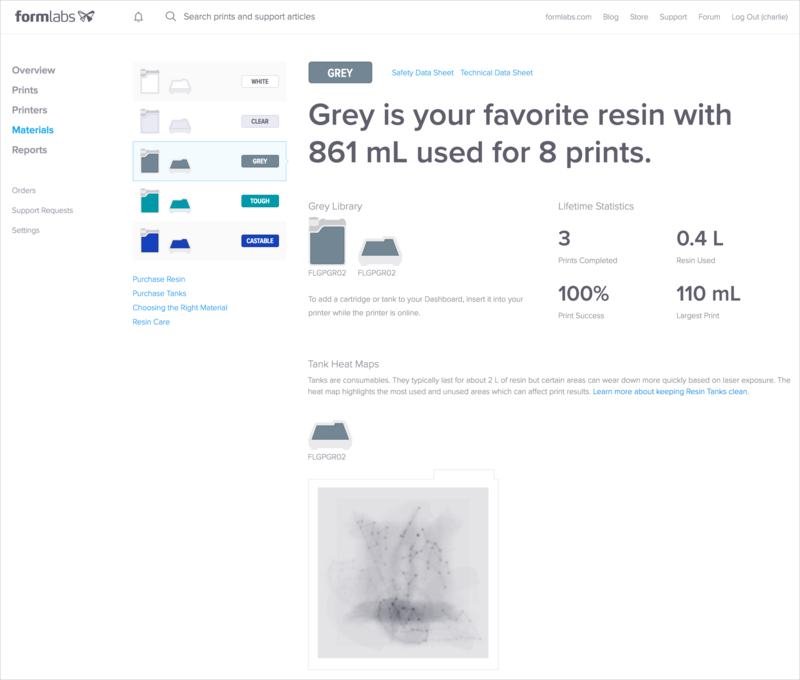 We’ve added filtering, comments, and activity feeds on the Prints page, a status overview for all of your printers, and more robust ways to track resin and consumables usage, including new tank heat maps. 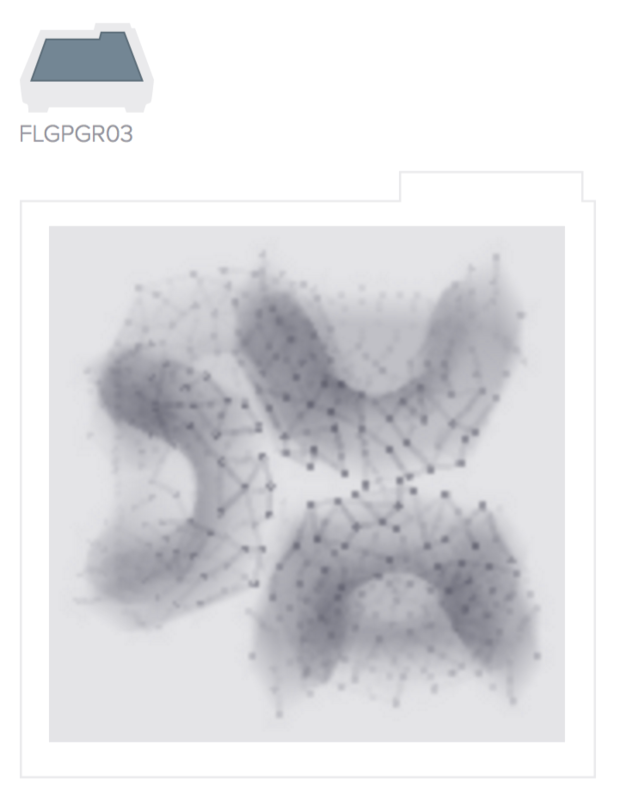 Log in to Dashboard now to explore new features, or create a free account and read our guide to Tracking Prints with Dashboard. Review prints at a glance on the Prints page. On the new Prints page, review all of your prints at a glance and search for specific prints by file name. Select any print to track activity, leave notes on performance, and log what printed successfully to easily keep track of changes you may wish to make to that model in the future. Learn more about how to optimize your prints in PreForm by watching our videos on orienting and supporting your 3D model. The Printers page offers an overview of each of your printers. Managing and maintaining multiple 3D printers becomes easier with a dedicated tracking resource. The new Printers page offers an overview of each printer’s status, plus a history of each individual printer’s performance. From the “Settings” page, set up email or SMS alerts to track printers from anywhere and know when specific printers might need your attention. Track resin tanks and cartridges from the Materials page. From the Materials page, track all of your resin tanks and cartridges. Dive deeper to view stats specific to each resin, including a list of all of the parts you’ve printed with that material. From the same page, quickly reference links to related data sheets and support articles. Prolong the lifetime of each resin tank with the new Tank Heat Maps. Tanks are consumables that typically last for about 2 L of resin, but certain areas can wear down more quickly based on part orientation and laser exposure. Each Heat Map visualizes the most used and unused areas of your resin tanks. Each Heat Map visualizes the most used and unused areas, providing objective data to help you more effectively lay out parts for future prints and decide when a tank is ready to be replaced. Quickly glance at the most important information on the Overview page. Quickly glance at the most important information on the Overview page, redesigned to provide a balanced understanding of your printers, print successes, recent prints, and material library. Visit the Dashboard page to log in and try the new features or to register and start tracking your printers and materials.